This word search was made to be used with Jessica Petersen’s book Old Tracks, New Tricks. Students fill find hidden words and spell a few rhyming words as well. PRINTING: When printing, make sure to select “Fit to Page” or “Scale to Fit” to ensure that all borders, text, and graphics print correctly and on one page. 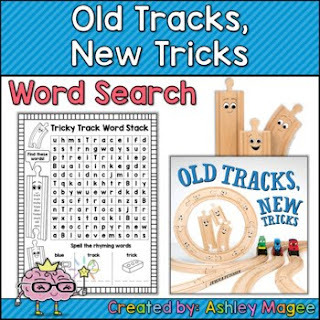 About the Book Old Tracks New Tricks: When three creative train tracks join an old wooden train set, the bossy engines blare orders, and the bored tracks snore on the floor. Can the three little tracks show the whole train set how to work together and invent new fun? Part fun, rhyming story, part activity idea book, Old Tracks, New Tricks shows kids how to create new ways to play with their favorite toys. Character art is used with express written permission from Jessica Petersen and The Innovation Press.